"If nature has made any one thing less susceptible than all others of exclusive property, it is the action of the thinking power called an idea, which an individual may exclusively possess as long as he keeps it to himself; but the moment it is divulged, it forces itself into the possession of every one, and the receiver cannot dispossess himself of it." "<The Congress shall have Power> To promote the Progress of Science and useful Arts, by securing for limited Times to Authors and Inventors the exclusive Right to their respective Writings and Discoveries;"
Intellectual property is inherently in the public domain, or a trade secret, unless a government comes in to protect it. Intellectual property, in the U.S. sense, is only exclusive property for a time. The historical records around these quotes reveals quite a lot, but I find it is hard to get perfectly clearly into the mind of Thomas Jefferson on this and perfectly clearly into the role that Jefferson had in that line in the Constitution. However, I am going to argue that he did play a critical role and that he had a clear view that Intellectual Property must only be protected for a time and not be either allowed simply to be in the public domain, nor given ownership through life and successive generations. In other words, while Jefferson was not acting alone in the constitutional provision, he was one of the key procreators of the modern understanding of Intellectual Property. But some people have noted Jefferson was in France while the U.S. Constitution was written. So, he could not have been seminally involved in establishing what has become the world standard for Intellectual Property. Indeed, the Constitution was penned by James Madison. I will argue that Jefferson was in fact seminally involved, and after the Constitution was written and ratified, involved as a key procreator and definer of Intellectual Property as we know it today. It is certain that the U.S. Constitution is the first national law that grants intellectual property protection for limited times. Indeed, only England in those times had any form of Intellectual Property Protection. In Europe, the protection of Intellectual Property was considered shameful. The mainland European reasoning is not Jefferson's reasoning above. It is that society is harmed if people can own ideas. Secret your ideas from observation if you want to own them. Otherwise there is no protection. In England there was a notion of ownership of Literature (Copyright) and Art (Patents). The terms "copyright" and "patent" were in use. However, in England, these Intellectual Properties were protected as ordinary property, owned for life and heirs. The framers of the Constitution added "limited times." The deal to strike the balance between societal harm by letting people own ideas and societal benefit by not letting people own ideas except through secrecy, was the addition of "limited times." It is of interest that the U.S. Constitution did not either distinguish copyright from patents nor did it put dates on the exclusivity limitations. These would come later mainly from Jefferson. But even while the U.S. Constitution and Bill of Rights was being drafted, Jefferson was in correspondence with Madison precisely on the topic of intellectual property rights. The accepted historical interpretation, however, is that Jefferson took the mainland European view and wanted no government protection for Intellectual Property in the beginning, but later 'somehow caved into' Madison's view (for example here and here). In reading through as much of the original letters as I can find on this Saturday Adventure, I find that it looks like Madison was off copying the English and Jefferson was arguing for the critical "for limited times." In other words, I don't see the evidence that Jefferson and Madison, and whoever else took interest at the time, we doing anything other than coming to a conclusion they jointly believed would be to the good of society. Jefferson was, however, arguing vigorously against the English in-perpetuity model that Madison seems to not have much of a problem with. 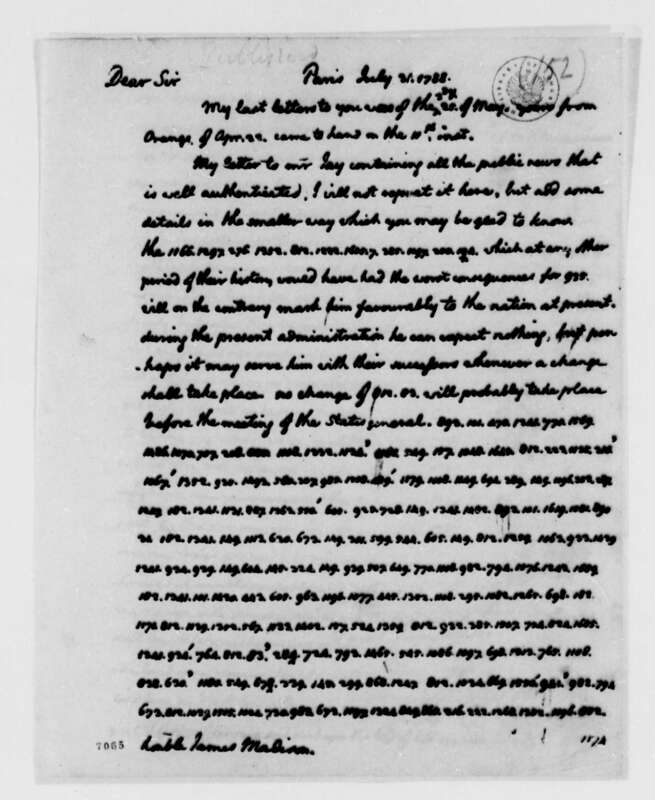 Here is the set of correspondences between Jefferson and Madison that claims to show that Jefferson actually wanted the European view. "I sincerely rejoice at the acceptance of our new constitution by nine states. It is a good canvas, on which some strokes only want re-touching. What these are, I think are sufficiently manifested by the general voice from North to South, which calls for a bill of rights. It seems pretty generally understood that this should go to juries, habeas corpus, standing armies, printing, religion and monopolies. I conceive there may be difficulty in finding general modification of these suited to the habits of all the states. But if such cannot be found then it is better to establish trials by jury, the right of Habeas corpus, freedom of the press and freedom of religion in all cases, and to abolish standing armies in time of peace, and monopolies, in all cases, than not to do it in any... The saying there shall be no monopolies lessens the incitements to ingenuity, which is spurred on by the hope of a monopoly for a limited time, as of 14 years; but the benefit even of limited monopolies is too doubtful to be opposed to that of their general suppression." "With regard to monopolies they are justly classed among the greatest nuisances in government. But is it clear that as encouragements to literary works and ingenious discoveries, they are not too valuable to be wholly renounced? Would it not suffice to reserve in all cases a right to the public to abolish the privilege at a price to be specified in the grant of it? Is there not also infinitely less danger of this abuse in our governments than in most others? Monopolies are sacrifices of the many to the few. Where the power is in the few it is natural for them to sacrifice the many to their own partialities and corruptions. Where the power, as with us, is in the many not in the few, the danger can not be very great that the few will be thus favored. It is much more to be dreaded that the few will be unnecessarily sacrificed to the many." BUT! Jefferson also regarded other kinds of property as requiring government sanctioned monopoly to secure. Indeed, in his letter to McPherson he notes just above the above quote and in the same paragraph, that even land requires governmental monopoly protection to secure to the land owner. "It is agreed by those who have seriously considered the subject, that no individual has, of natural right, a separate property in an acre of land, for instance. By an universal law, indeed, whatever, whether fixed or movable, belongs to all men equally and in common, is the property for the moment of him who occupies it; but when he relinquishes the occupation, the property goes with it. Stable ownership is the gift of social law, and is given late in the progress of society." So how can you argue that Jefferson was saying that all monopoly should be abandoned? I think there is an alternative interpretation to Jefferson's writing that is in much more accord with his other writings and with his experience and behaviors (e.g., on Patent boards). My conclusion is that he was really saying that if the limited time cannot be short, like 14 years, then the benefit to the inventor wasn't worth the cost to society and that if the states cannot agree to a limit, it would be better to adopt the mainland European stance than the English in perpetuity stance. Jefferson said if the states couldn't agree then it was better ".. to abolish standing armies in time of peace, and monopolies, in all cases, than not to do it in any" ibid. I agree with others and think Jefferson, and other framers of the Constitution, are turning over in their grave at the Mickey Mouse extension of copyright to 75 years. If we want to protect Mickey Mouse cartoons forever, lets pass a bill just to protect Mickey Mouse cartoons forever but don't apply such shame to all of society. Also see Jefferson's Objections to the Constitution to Madison that show, I believe, that he was very involved as a framer even from Paris and wanted limits on monopoly to be expressed more concretely. Also see Jefferson's earlier statement that even physical property, land and dwelling, rights are not natural rights and must be enforced as monopoly by law. This statement was in a letter to Madison after the above one that is purported to be saying Jefferson wants no monopoly and before Madison's response! "I sincerely rejoice at the acceptance of our new constitution by nine states. It is a good canvas, on which some strokes only want retouching. What these are, I think are sufficiently manifested by the general voice from North to South, which calls for a bill of rights. It seems pretty generally understood that this should go to Juries, Habeas corpus, Standing armies, Printing, Religion and Monopolies. I conceive there may be difficulty in finding general modification of these suited to the habits of all the states. But if such cannot be found then it is better to establish trials by jury, the right of Habeas corpus, freedom of the press and freedom of religion in all cases, and to abolish standing armies in time of peace, and Monopolies, in all cases, than not to do it in any. The few cases wherein these things may do evil, cannot be weighed against the multitude wherein the want of them will do evil. In disputes between a foreigner and a native, a trial by jury may be improper. But if this exception cannot be agreed to, the remedy will be to model the jury by giving the medietas linguae in civil as well as criminal cases. Why suspend the Hab. corp. in insurrections and rebellions? The parties who may be arrested may be charged instantly with a well defined crime. Of course the judge will remand them. If the publick safety requires that the government should have a man imprisoned on less probable testimony in those than in other emergencies; let him be taken and tried, retaken and retried, while the necessity continues, only giving him redress against the government for damages. Examine the history of England: see how few of the cases of the suspension of the Habeas corpus law have been worthy of that suspension. They have been either real treasons wherein the parties might as well have been charged at once, or sham-plots where it was shameful they should ever have been suspected. Yet for the few cases wherein the suspension of the hab. corp. has done real good, that operation is now become habitual, and the minds of the nation almost prepared to live under it's constant suspension. A declaration that the federal government will never restrain the presses from printing any thing they please, will not take away the liability of the printers for false facts printed. The declaration that religious faith shall be unpunished, does not give impunity to criminal acts dictated by religious error. The saying there shall be no monopolies lessens the incitements to ingenuity, which is spurred on by the hope of a monopoly for a limited time, as of 14. years; but the benefit even of limited monopolies is too doubtful to be opposed to that of their general suppression. If no check can be found to keep the number of standing troops within safe bounds, while they are tolerated as far as necessary, abandon them altogether, discipline well the militia, and guard the magazines with them. More than magazine-guards will be useless if few, and dangerous if many. No European nation can ever send against us such a regular army as we need fear, and it is hard if our militia are not equal to those of Canada or Florida. My idea then is, that tho' proper exceptions to these general rules are desireable and probably practicable, yet if the exceptions cannot be agreed on, the establishment of the roles in all cases will do ill in very few. I hope therefore a bill of rights will be formed to guard the people against the federal government, as they are already guarded against their state governments in most instances." Finally, and I think completely convincingly for my case, here is the WHOLE paragraph from Madison October 17, 1788 (above). Madison is arguing not to be too concrete (e.g., 14 years) because people will disagree. Further evidence that Jefferson was really saying "well, if you can't agree on a time limit nationally, then it is better to make intellectual property protection no time at all than forever!" Also note that Jefferson says if society protects the financial interest in an idea for a time, obviously nobody can complain about that (doesn't sound like somebody arguing for no protection to me). "Supposing a bill of rights to be proper the articles which ought to compose it, admit of much discussion. I am inclined to think that absolute restrictions in cases that are doubtful, or where emergencies may overrule them, ought to be avoided. The restrictions however strongly marked on paper will never be regarded when opposed to the decided sense of the public; and after repeated violations in extraordinary cases, they will lose even their ordinary efficacy. Should a Rebellion or insurrection alarm the people as well as the Government, and a suspension of the Hab. Corp. be dictated by the alarm, no written prohibitions on earth would prevent the measure. Should an army in time of peace be gradually established in our neighborhood by Britain: or Spain, declarations on paper would have as little effect in preventing a standing force for the public safety. The best security agst. these evils is to remove the pretext for them. With regard to monopolies they are justly classed among the greatest nuisances in Government. But is it clear that as encouragements to literary works and ingenious discoveries, they are not too valuable to be wholly renounced? Would it not suffice to reserve in all cases a right to the Public to abolish the privilege at a price to be specified in the grant of it? Is there not also infinitely less danger of this abuse in our Governments, than in most others? Monopolies are sacrifices of the many to the few. Where the power is in the few it is natural for them to sacrifice the many to their own partialities and corruptions. Where the power, as with us, is in the many not in the few, the danger can not be very great that the few will be thus favored. It is much more to be dreaded that the few will be unnecessarily sacrificed to the many." Well, the specific limitation on time for Intellectual Property never did make it to the Bill of Rights. But! When Jefferson got back to the States and became Secretary of State and then President, he fixed that! See his later letters as he worked out protections for copyrights and patents and the what gets protected and what doesn't. I don't see how this is the mark of a man who believed the mainland European view. He just didn't believe in the English view either. "It has been pretended by some, (and in England especially,) that inventors have a natural and exclusive right to their inventions, and not merely for their own lives, but inheritable to their heirs. But while it is a moot question whether the origin of any kind of property is derived from nature at all, it would be singular to admit a natural and even an hereditary right to inventors. It is agreed by those who have seriously considered the subject, that no individual has, of natural right, a separate property in an acre of land, for instance. By an universal law, indeed, whatever, whether fixed or movable, belongs to all men equally and in common, is the property for the moment of him who occupies it; but when he relinquishes the occupation, the property goes with it. Stable ownership is the gift of social law, and is given late in the progress of society. It would be curious then, if an idea, the fugitive fermentation of an individual brain, could, of natural right, be claimed in exclusive and stable property. If nature has made any one thing less susceptible than all others of exclusive property, it is the action of the thinking power called an idea, which an individual may exclusively possess as long as he keeps it to himself; but the moment it is divulged, it forces itself into the possession of every one, and the receiver cannot dispossess himself of it. Its peculiar character, too, is that no one possesses the less, because every other possesses the whole of it. He who receives an idea from me, receives instruction himself without lessening mine; as he who lights his taper at mine, receives light without darkening me. That ideas should freely spread from one to another over the globe, for the moral and mutual instruction of man, and improvement of his condition, seems to have been peculiarly and benevolently designed by nature, when she made them, like fire, expansible over all space, without lessening their density in any point, and like the air in which we breathe, move, and have our physical being, incapable of confinement or exclusive appropriation. Inventions then cannot, in nature, be a subject of property. Society may give an exclusive right to the profits arising from them, as an encouragement to men to pursue ideas which may produce utility, but this may or may not be done, according to the will and convenience of the society, without claim or complaint from any body. Accordingly, it is a fact, as far as I am informed, that England was, until we copied her, the only country on earth which ever, by a general law, gave a legal right to the exclusive use of an idea. In some other countries it is sometimes done, in a great case, and by a special and personal act, but, generally speaking, other nations have thought that these monopolies produce more embarrassment than advantage to society; and it may be observed that the nations which refuse monopolies of invention, are as fruitful as England in new and useful devices.